Your one-stop aircraft resource with detailed technical information. Aircraft Data Viewer is a one-stop resource with detailed technical information on over 500 aircraft. Sort, rank, filter and compare aircraft specifications, then export the required output to PDF to present to operational staff or stakeholders. As a resource, Aircraft Data Viewer appeals to not only those involved in the planning and design of airport facilities, but also operational staff on the ground. Operators can choose between a range of flexible licensing options, making it possible to easily share Aircraft Data Viewer within a department, between departments, or even between sites. 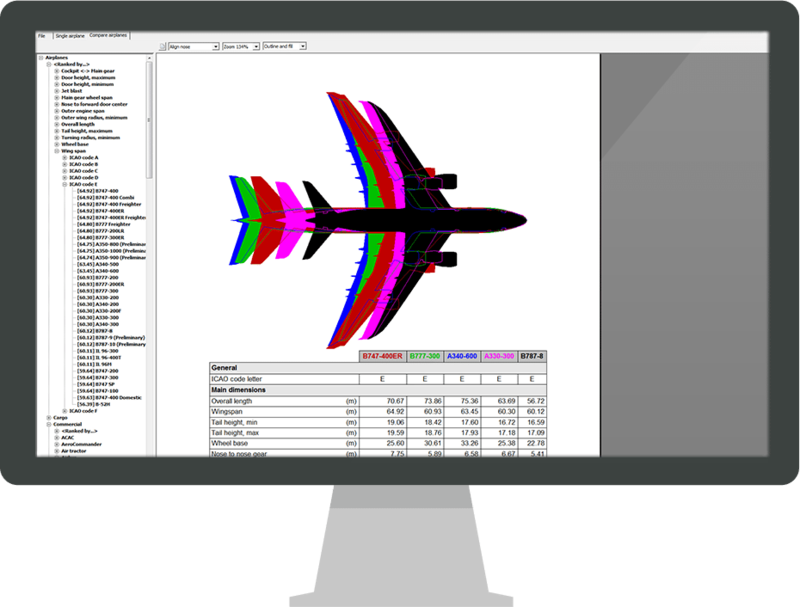 Aircraft Data Viewer presents detailed aircraft dimensions, steering characteristics, door locations and jet blast impact data in numerical and graphical format.